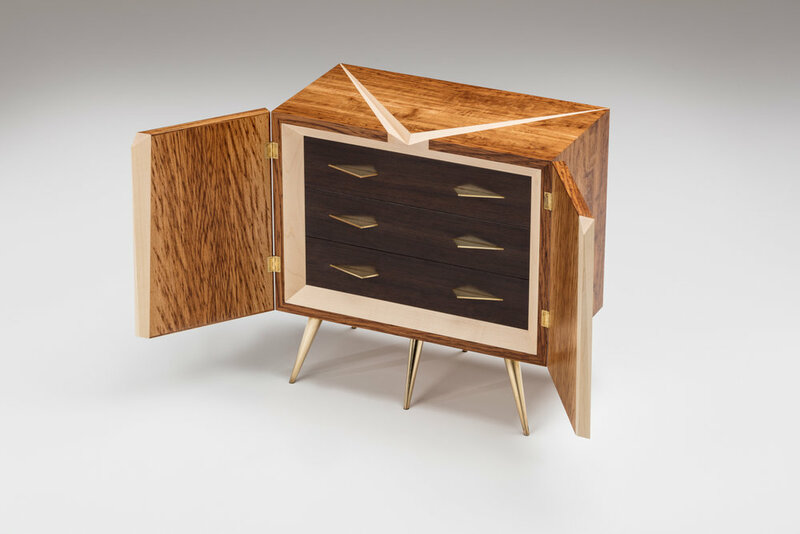 An abstraction of the construction of a conker, 'aesculus' is built almost entirely out of solid woods, with hinged doors concealing three piston-fit drawers. Genus of trees and shrubs found in north temperate regions, including the horse chestnut or conker tree. Conker shells are typically comprised of three segments, so when they crack open they tend to separate in three directions. I wanted aesculus to give the appearance of 'cracking' along the bevels recessed both into the cabinet top and doors. 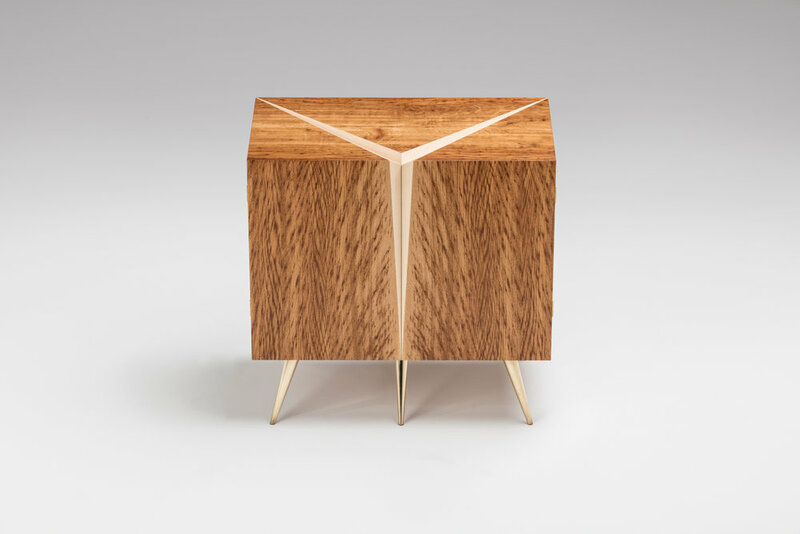 These 'cracks', apparently exposing the pale flesh of the conker's internal lining, are made from solid wedged-shaped inserts of sycamore, hand-shaped and set at angles within the solid brown oak outer carcass. The double doors separate at the front crack and swing open to reveal the dark brown conker within, nestling in its creamy cradle. 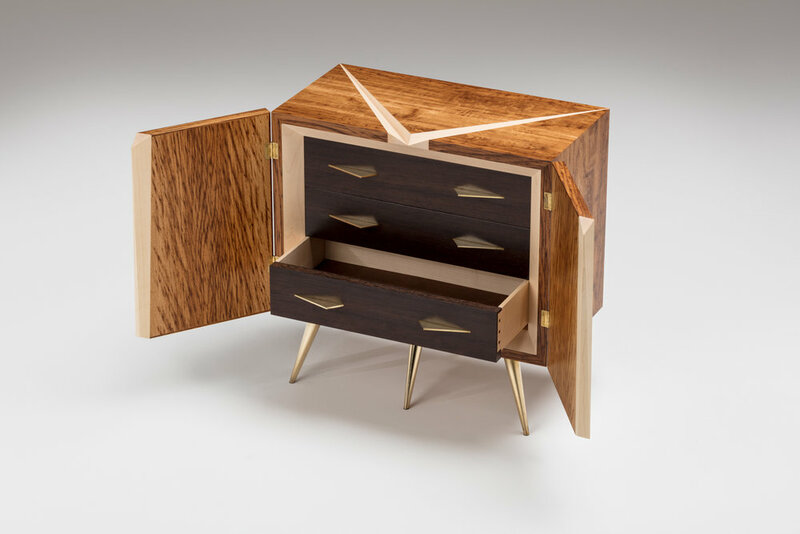 The pale internal framework is solid sycamore, whilst the drawer fronts use solid quartersawn wenge finished in shellac to provide the deep brown sheen associated most strongly with the conker seed itself. The drawer fronts are joined to the drawer sides with dowels made from brass tube and wenge dowels. A subtle but sophisticated detail drawing on the materials used elsewhere in the design, whilst providing a contemporary alternative to the more traditional dovetail construction often favoured. 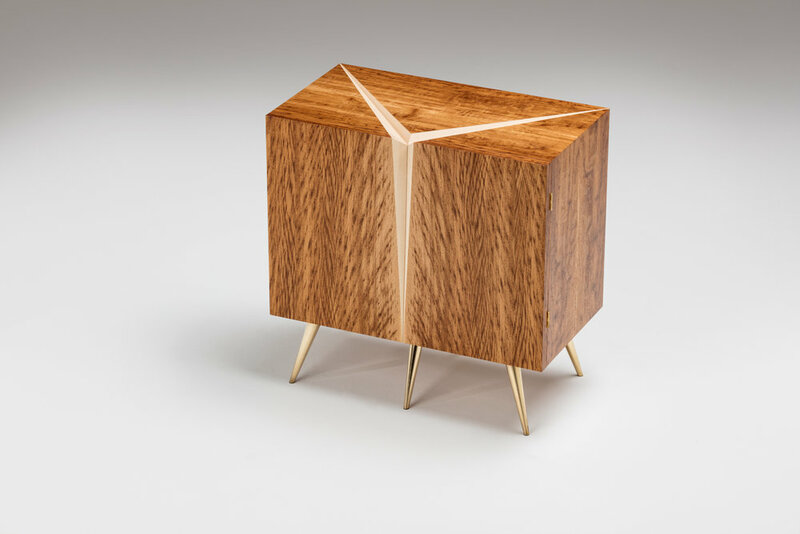 Solid brass drawer pulls, reflecting the angles of the carcass top, and natural leather lining complete the drawers, whilst the sharp taper of the turned solid brass legs hints at the spikes found on the conker's protective outer shell. 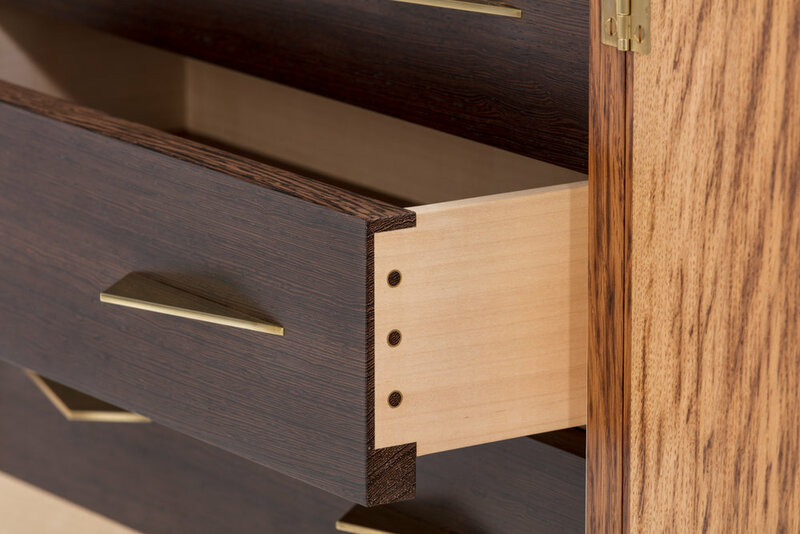 Although currently configured as three single-space drawers, these could each be compartmentalised to hold, for example, 36 wrist watches or a collection of other small items.